Does my insurance cover GrabHitch? 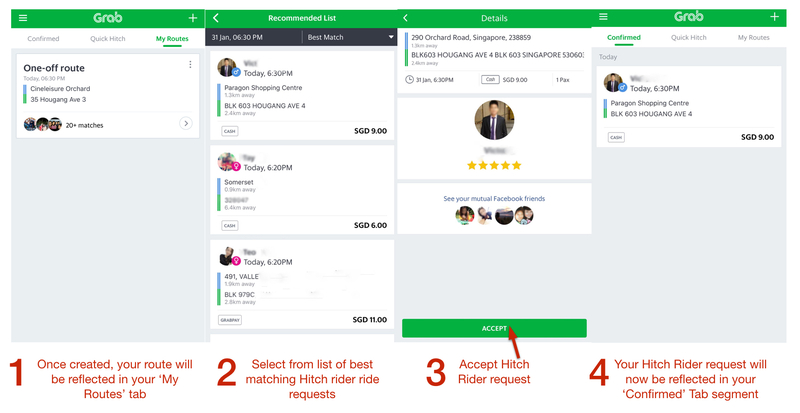 GrabHitch is a social carpooling service that allows non-commercial everyday drivers to ‘tumpang’ other fellow riders who are going the same way. Whether you are driving or need a ride to your destination, carpooling with GrabHitch allows you to recover some petrol costs or save on travelling while making a friend or two – all from the convenience of your mobile phone! We have sports cars, coupes, jeeps and many other interesting cars in the community and you don’t need any additional licensing nor documentation! Be at least 18 years of age and above. Have a valid Singapore Driver’s License with at least 1 year’s driving experience. A personal car with insurance. Once you click agree, your application will be submitted and approved within 1-2 working days. Now’s also the time to enter a referral code if you have one. Contribute to a car-lite Singapore! Create routes at your own convenience and you decide which passengers to pick up. You can choose to do it twice a day, on a particular weekday every week, only on weekends – it’s all up to you really! All GrabHitch rides are insured! GrabHitch, like other carpooling services, are classified under Section 142 of the Road Traffic Act. The Act states that you do not need to convert your private motor insurance to a commercial motor insurance policy to drive with GrabHitch. 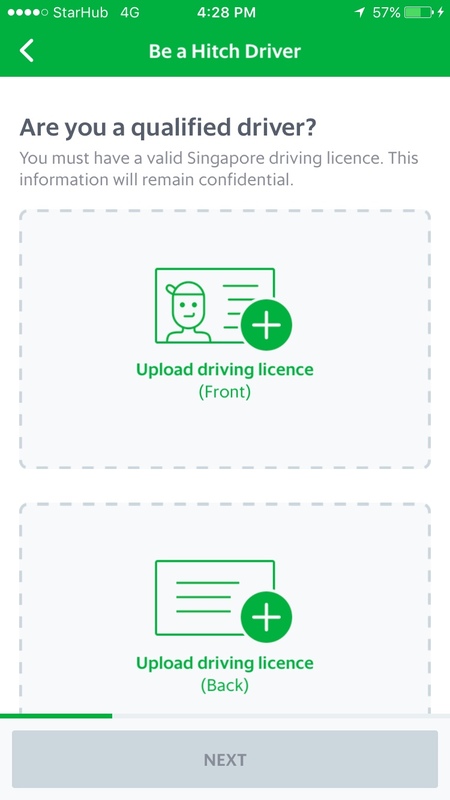 Income, AIG , MSIG and Aviva have confirmed that personal motor insurance purchased from them will be able to cover GrabHitch rides*, as we are considered a social carpooling platform, and not for hire or reward. We are in the midst of confirming with more insurers. For more information on accidents and insurance related questions, please click here. Based on current carpooling regulations, non-commercial drivers can only complete 2 trips in a calendar day. Please note that 2 trips a day limit is set by LTA regardless of whichever platform you use. We hope that you won’t put yourself and your riders at risk as your insurance may not cover if you do more than 2 trips a day in total, combined across all platforms. For drivers who are worried their insurance does not cover GrabHitch rides, remember we are the ONLY carpooling service who has purchased additional insurance for extra coverage provided no regulations are breached. 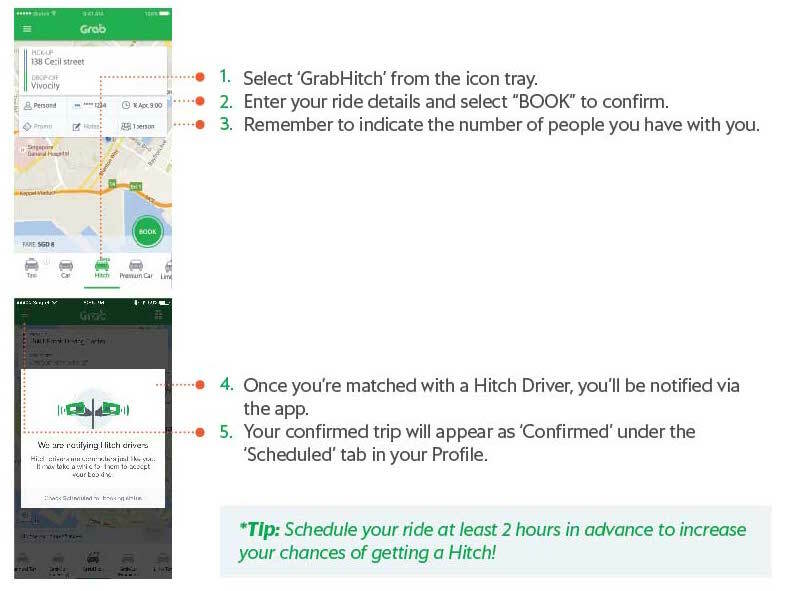 The GrabHitch driver and passenger function can be found on the SAME Grab App. 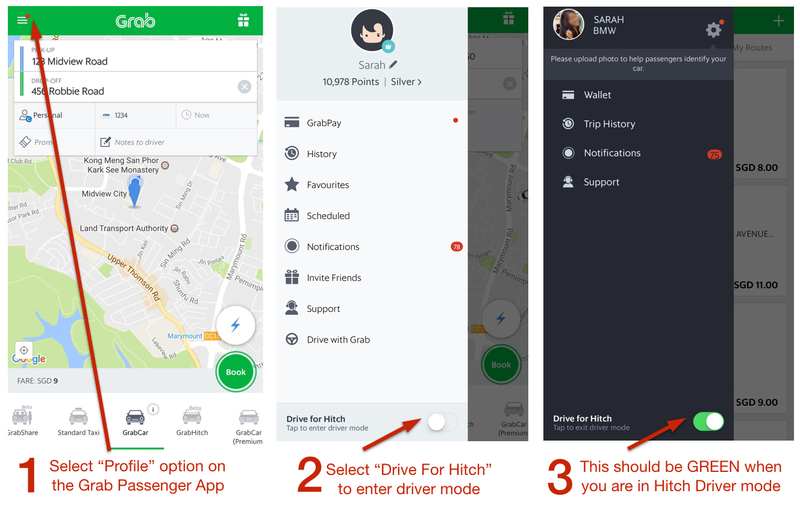 QuickHitch is a new function on the GrabHitch Driver dashboard that allows Hitch Drivers to pick Hitch Riders who are requesting for a Hitch from a nearby location. It is a quick and easy way for Hitch Drivers to select from a list of Hitch Riders, without having to go through the hassle of creating a route! Our Quick Hitch system matches Riders who are looking for a Hitch near your current location, so you don’t have to travel any further to Hitch someone! Routes can be scheduled up to 7 day in advance. In addition, when you create your route, you can even schedule it to repeat on multiple days. For example, you can select your daily drive to work to repeat every Monday to Friday. We will search for a passenger for you every morning as long as the route is valid. You can use this to create one-off routes too – just set the time and day of week and delete the route after your trip is done. Navigate to the “My Routes” tab to see routes that you created. Click on each route to view Hitch Rider ride requests that best match your created routes. Click on the ride requests to see more details. Subsequently, click “ACCEPT” at the bottom of the screen if you would like to offer a ride. Once you click “ACCEPT”, the Hitch Rider will receive a notification of your offer. Do also SMS/call your Hitch Rider to confirm details of the ride! Before your Hitch Ride, we strongly recommend that you text your Hitch Riders to confirm the time and place for the ride so as to facilitate in a smoother Hitch pick up! Being a Hitch Rider is easy, it is as simple as booking a regular transport – just that you get to have the choice of scheduling your booking in advance! Well, cheaper rides is one main reason! Taking a GrabHitch can be 20-40% cheaper than other options like Taxis. Furthermore, you can meet interesting people and maybe even make a new life-long friend. Some of our users have rediscovered long lost childhood friends, secured job interviews or wedding photography services, and even received parenting tips from their new friends! Always be at your Pick-Up Point in advance as you wouldn’t want to hold others up. Sit in front just like you would in a friend’s car, unless it is already occupied. Smile and make a new friend! That’s what social carpooling is all about! For existing GrabHitch drivers and riders: thank you for continuously showing your support for our social ride sharing platform. Share the love and spread the joy and get $20 for every additional driver you refer to GrabHitch! How do I sign up as a Hitch Driver? Easy as 1-2-3! Get your mobile phone and driving license ready and click here for the step-by-step guide to join us. Of course! 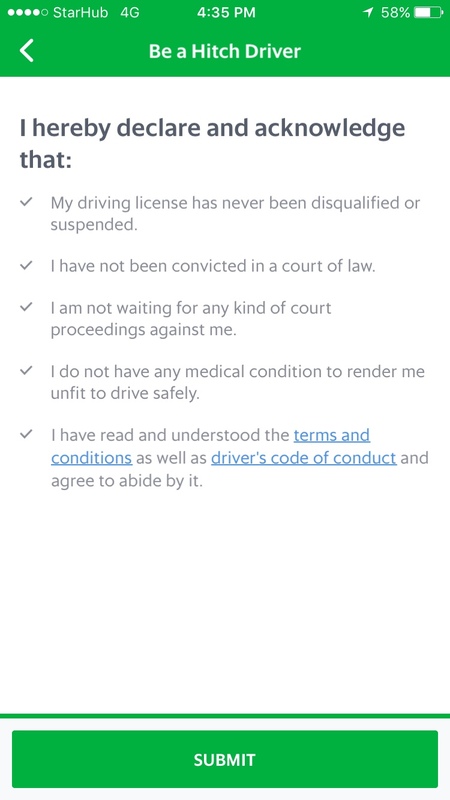 GrabHitch is fully legal and in compliance with Singapore’s regulations. As of March 2015, under Road Traffic (Car Pools) (Exemption) Order 2015, LTA has made it possible for everyday drivers to be compensated for providing carpooling services. 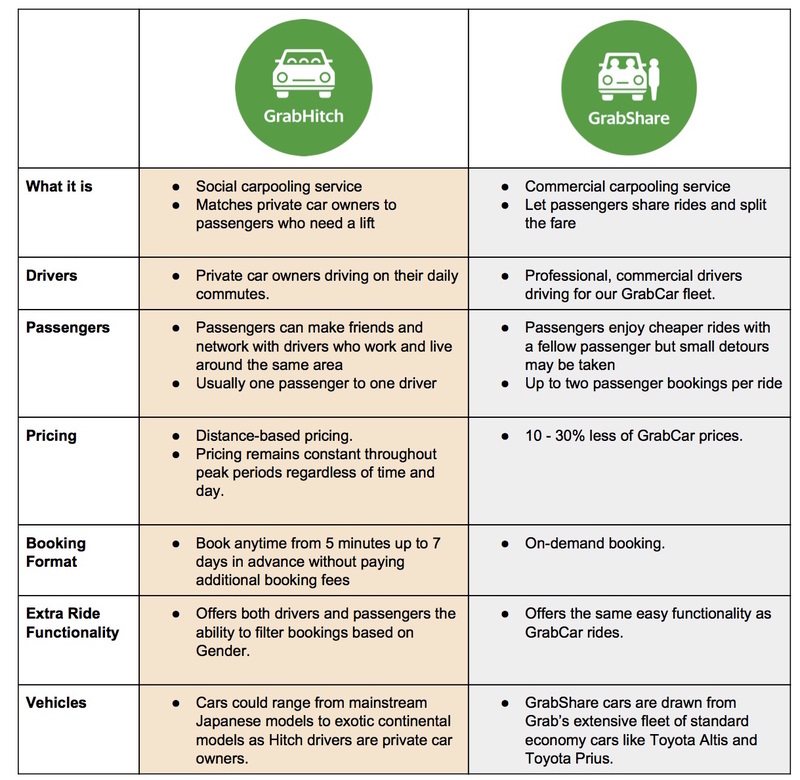 What is the difference between GrabHitch and GrabShare? Both products are housed under the Grab app. GrabHitch is a social carpooling platform powered by everyday, non-commercial drivers giving you a lift along the way to cover petrol costs. On the other hand, GrabShare is on-demand ridesharing service provided by professional GrabCar drivers which allows you to share your ride and your fare with another party going in the same direction. Why should I use GrabHitch? Well, you get to save more with our affordable pricing (20-40% lower than taxis), make new friends and contribute to a car-lite city. So, why not? Our Hitch Community has seen people reuniting with their childhood pals or even their future boss. You never know who you might meet next! Is GrabHitch safe to use? Can my Hitch Driver see all my personal details? Hitch Drivers will only be able to see your name, profile photo and mutual friends on Facebook (if you both have logged in with your FB account) in your booking request. Only upon accepting your booking will the Hitch Driver then be able to view your contact number. You can create all your bookings through the GrabHitch tab in the Grab app. Just set your pick-up and drop-off locations, scheduled pick-up time (from 5 minutes up to 7 days in advance), select the number of passengers and any special request in the notes section. Click on the ‘Book’ icon and our servers will ping your route request to Hitch Drivers who share similar journeys. You’ll be notified via SMS and in-app notification when a Hitch Driver has confirmed your booking. We’ll also drop you a reminder 30 minutes before your scheduled pick-up time. GrabHitch is a social carpooling initiative where trust is the backbone of our service. We strongly discourage you from cancelling on your Hitch Driver who has already made plans to give you a lift. However, should you find it absolutely necessary to do so, do give him/her a heads up as early as you can. To cancel your booking in the app, find under the menu: Scheduled > GrabHitch > Booking > Cancel Booking. How many trips can I book in a day? There’s no limit as a Hitch Rider so go ahead and ride as much as you want! Will I be sitting with other passengers I don’t know in the car? Although the majority of our Hitch Rides only involve one Hitch Rider, there’s a possibility that you could be riding with your Hitch Driver’s own friends or family, or a fellow Hitch Rider heading the same way. We are a social carpooling platform so be open about commuting with others! How is my journey fare calculated? We compute the price based on the distance between your pickup and drop off locations. You’ll be happy to know that this price is fixed all day, i.e. not volatile to peak hour surge! How do I pay my Hitch Driver? Payment is easy! You can choose to pay via GrabPay or Cash. Remember to select either option before you make the booking! What if I am carrying luggage or other bulky items? You have to indicate your question in the ‘Notes to driver’ box before you make your booking. Once accepted, you may like to SMS your Hitch Driver to confirm if he/she is okay with your request. It doesn’t hurt to check! I booked a GrabHitch ride but my Hitch Driver didn’t show up! What do I do? You may like to try texting or calling your Hitch Driver first. If he/she remains uncontactable, we’re afraid you’ll have to cancel the trip and request for another ride. We’re sorry if this happens to you as we understand how disappointed you must be. Rest assured that we constantly monitor the misbehavour of Hitch Drivers to improve the quality of your experience. What if the vehicle plate number or Hitch Driver that’s supposed to pick me up is different from the one that arrives? We suggest that you don’t board the vehicle and report the incident to us as soon as possible by writing to support.sg@grab.com. 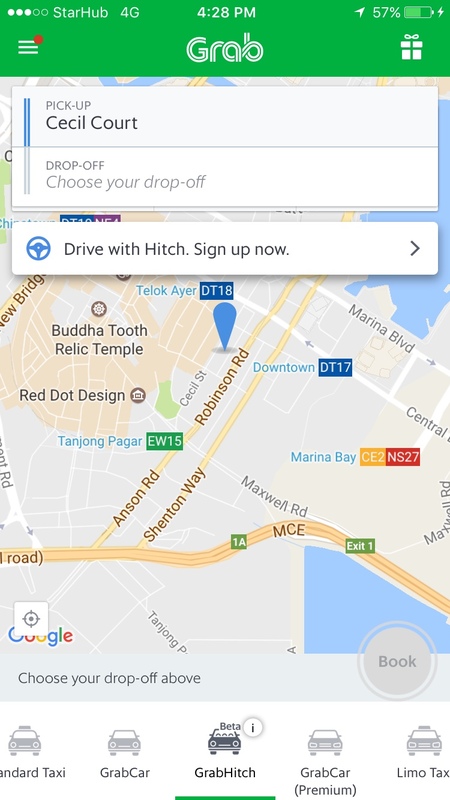 Why can’t I get a GrabHitch driver as easily as GrabCar or GrabTaxi? GrabHitch is meant as an advance booking service as we are powered by non-commercial, everyday drivers who give Hitch Riders a lift at their convenience. Hence, there may not always be any available Hitch Drivers who are heading the same way as you do at your specified time. To secure a higher chance of being matched, book as early as you could, even up to 7 days in advance! Is there a penalty for cancellation? As a Hitch Community of social carpoolers, we like to keep things on the positive side and not impose cancellation charges. That doesn’t mean you should abuse our service though! Hitch Drivers are non-commercial drivers who are giving you a lift on their way to and from work. Let’s not take their contribution for granted! Do note that we do suspend Hitch Riders who cancel on their confirmed Hitch Drivers frequently without ample notice. Can I choose my own Hitch Driver? Nope, sorry you can’t! However, before you make your booking, you may request for a same-gender Hitch Driver by indicating in the bottom right box of the booking page. How about extra charges like ERP? ERP fees are not included in the fare and they will typically be borne by your Hitch Driver. However, do understand that in cases where your Hitch Driver may enter an ERP zone just to pick you up or drop you off, he/she is allowed to ask you to share the cost with him. Should you be unwilling to do so, simply reject him/her in a nice manner. You may also feel free to offer to pay for ERP fees by indicating in the ‘Notes’ comment box when you make your booking. P.S. this increases your chance of getting matched! Why can’t I use GrabPay? Oops, you’ve a transaction that was declined by your bank. Do write in to us at support.sg@grab.com with the subject title “Recharge” and provide us with the last 4 digits and expiry date of your credit card that is registered in the Grab app for verification. Upon successful recharge, you’ll be able to use your credit card for GrabPay again. I’ve received a promo code ‘XYZ’. How do I use it? You may apply your promo code by entering it in the ‘Promo’ box after you’ve keyed in your trip details. Once you’ve made your booking, you may confirm if the promo code has been successfully applied by checking the discounted fare in the app under Scheduled > GrabHitch > Booking. Congrats on greater savings! Who pays for the insurance in the event of an accident? In such an unfortunate event your Hitch Driver’s insurance will cover the costs of the accident. What else should I take note of as a Hitch Rider? We are all about social carpooling and social carpooling is about being SOCIAL. Take the front seat and make new friends! Learn how to Hitch the right way here. Your Hitch Driver is not a commercial driver like our GrabCar partners so they appreciate if you could treat them the same way you would treat a friend giving you a (discounted) lift to your destination! Book in advance to maximise the chances of you getting a match! We can’t emphasise this enough but really, it helps to be a little kiasu. Book the night before for a morning commute or 2 hours ahead of your evening ride home. So glad you asked! We know you’re busy so registration is completely online. Get your mobile phone and driving license ready and click here for the step-by-step guide to join us. We can’t wait to have you onboard! Why should I sign up with GrabHitch? What’s in it for me? As a Hitch Driver, you get to benefit in 3 big ways: Cover your petrol costs, make new friends and contribute to a car-lite Singapore! All these at your convenience! How is being a GrabHitch driver different from being a GrabCar driver? They’re not the same at all! GrabCar drivers are commercial, professional drivers who have to register a business, purchase commercial insurance, convert their car to a commercial vehicle at the LTA and then sign up in person at the Grab office. Since Hitch Drivers are everyday, non-commercial private car owners who are not driving as a profession, the sign up process is way easier. No need for commercial vehicle conversion nor insurance, simply launch the Grab app, take a couple of photos and submit them for verification. And you’re done! Does Grab deduct any fees from my fares like commercial driving services? Nope! Currently, we don’t charge any commission/service fee from our Hitch Drivers as we want everyone to give social carpooling a shot. So go ahead and keep 100% of the fare! 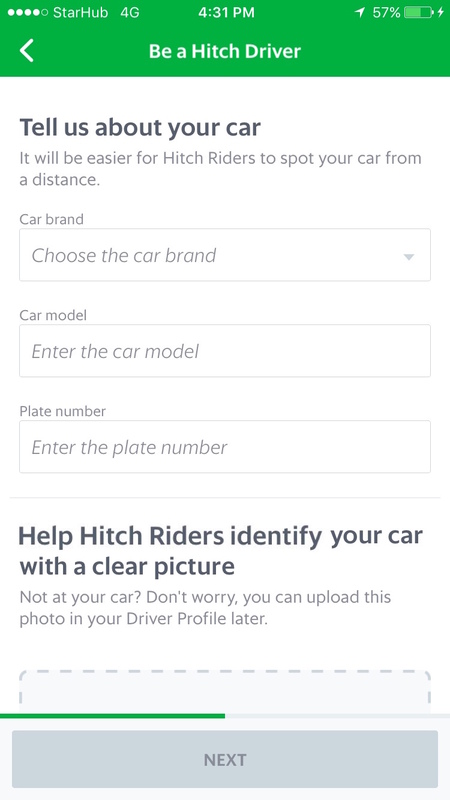 Do I select my Hitch Rider or will I be matched automatically? We give you full autonomy to decide who you want to pick up that you find most convenient. 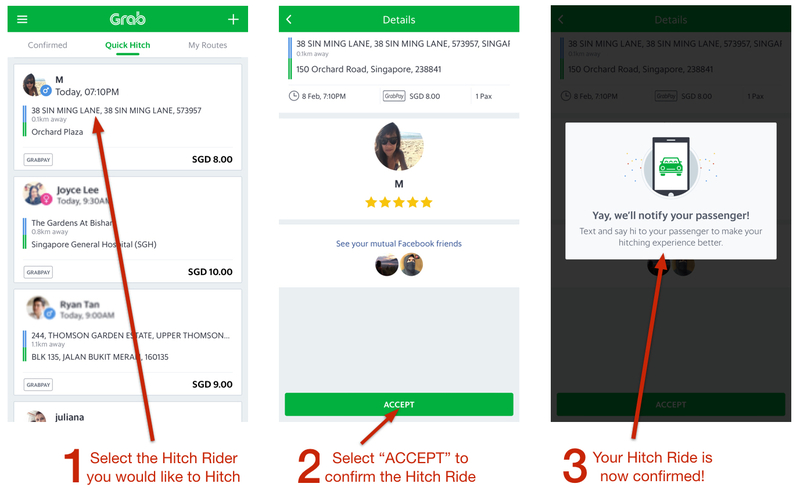 2 ways to find your Hitch Rider: Check ‘Quick Hitch’ for the list of requests that best matches your current location and time, or create a route and see who’s heading the same way as you! How much can I earn per trip? 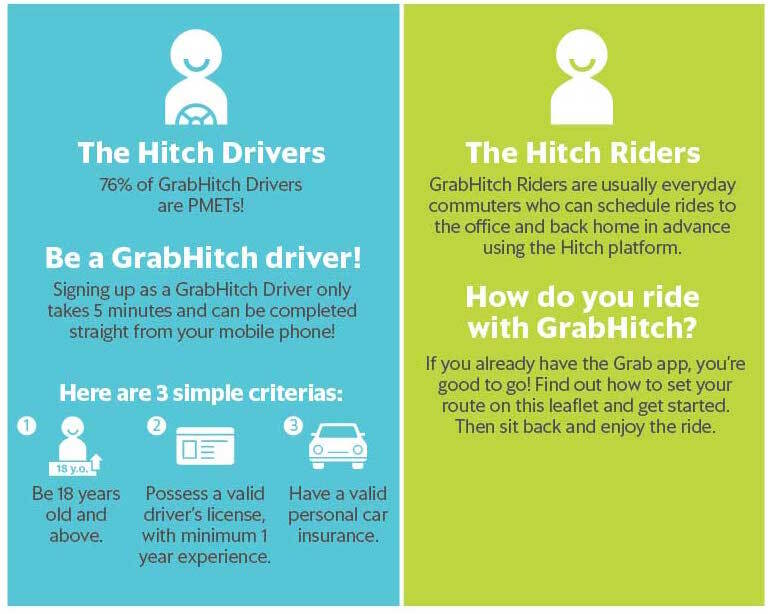 GrabHitch is meant to subsidise your cost of driving i.e. mainly petrol costs and not meant for you to make profits. That being said, you can expect to receive between $8 to $12 per pickup on average. If you do 2 pickups a day, that’s around $600 a month. Ain’t that decent? Hitch Drivers should bear the cost of ERP, especially if you were to already incur it on your own intended route. In cases where you have to enter an ERP zone just to pick up or drop off your Hitch Rider thereby incurring additional fees, you may gently ask your Hitch Rider to share the cost with you. Do check with him/her upon accepting the booking and not during or after the ride to avoid dispute. However, should your Hitch Rider be unwilling to do so, please don’t insist nor resort to any rude or threatening behaviour. Let’s be gracious to each other and enjoy the best of social carpooling together! How many trips can I offer a day as a Hitch driver? Based on current carpooling regulations, non-commercial drivers can only complete 2 trips in a calendar day. While we appreciate your enthusiasm for carpooling, please note that 2 trips a day limit is set by LTA regardless of whichever platform you use. After your application has been approved, click DRIVE then go to “Create Route” tab. Enter your trip details and you’ll be alerted to a list of Hitch Riders who share similar journeys in the app. You can also sort through the list to see who fits your journey best. Alternatively, you may also check out the “Quick Hitch” tab for an immediate list of Hitch Riders near your current location and time. Either way works! Once you’ve accepted the request, you will then be able to see your Hitch Rider’s contact number. Do confirm with him/her via SMS or call prior to the pickup just to be sure! Can I do multiple pickups in a single trip? Yes you may do multiple pickups per trip on the way to your intended destination with minimum detour. However, you must check with all of your Hitch Riders if they are comfortable to ride with other Hitch Riders and importantly, the expected delay in each of their arrival time. Nobody likes to be shocked so please give them all a heads up! GrabHitch is a social carpooling initiative where trust is the backbone of our service. So once you’ve confirmed with your Hitch Rider, please don’t cancel on him/her. However if you absolutely have to cancel, please do so in advance and inform your Hitch Rider so that he/she can plan for alternative modes of transport (and not be left stranded). To cancel your booking in the app, go to Confirmed tab > Booking > Cancel Booking. How am I paid by my Hitch Rider? You’ll be able to view the payment mode indicated by Hitch Riders in the booking request – Cash or GrabPay (credit card). For Cash, simply collect the cash amount from your Hitch Rider upon dropping off, ensuring you’ve sufficient change. For GrabPay, your earnings will be credited directly into your digital driver wallet. You may choose to cash out credits in your wallet at any time. Simply provide us with your bank account details the first time you request to cash out. Do expect up to 10 working days for the cash out amount to be reflected in your bank account. Are Hitch Riders allowed to bring people along? Am I paid per pax or per booking? Each booking may have more than one pax. Hitch Riders should indicate in their booking how many people are with them, so that you can decide if you’re comfortable before accepting the booking and plan your seating capacity accordingly. However, you will still be paid per booking regardless of the number of seats requested, so please don’t charge more! Do I need to pick up my Hitch Rider from an exact location or can I indicate a landmark within the neighbourhood to meet? Yes you have to pick up and drop off your Hitch Rider from the exact locations indicated in the booking. This facilitates a smooth and pleasant experience for both you and your Hitch Rider! Can I get my Hitch Rider to pay if we get into an accident? In case of such an unfortunate event, your vehicle insurance and personal insurance should cover the costs incurred from the accident. If assistance is required, contact us through our 24-hour hotline (+65 6570 3925) or email us at grabhitch@grab.com. Am I still considered a Hitch Driver if I don’t drive regularly? Of course you are! As a social initiative, we wouldn’t want to stress you out by imposing any penalty for irregularity. So please go ahead and enjoy driving GrabHitch at your convenience! As a Hitch Community of social carpoolers, we like to keep things on the positive side and not impose punishment. That doesn’t mean you should abuse our platform though! Do note that we do suspend Hitch Drivers who cancel on their confirmed Hitch Riders frequently without ample notice. How do I complete a pickup in the app? I’ve reached the pickup point but my Hitch Rider didn’t show up! What do I do? You may like to try texting or calling your Hitch Rider first. If he/she remains uncontactable, we’re afraid you’ll have to cancel the trip. We’re sorry if this happens to you as we understand how frustrating it must have felt to be stood up. Rest assured that we constantly monitor the misbehavour of Hitch Riders to best minimise such occurrence in future. Why is the booking status stuck at ‘Paying’ even though I’ve completed the pickup? In certain cases, we may experience a delay in payment being charged. Rest assured that if you have completed the pickup, we will definitely ensure that the fare is credited into your driver e-wallet. Usually this will be automatically resolved in 1-3 working days. No action is needed from you, only your patience and understanding! I have referred my friend and he has completed his first ride. Why have I not received my referral bonus? Thanks for spreading the good word! All referral bonuses will be credited to your wallet 10 working days after the programme has ended. When can I receive my cashout? Cashouts take up to 10 working days to be reflected in your bank account. I’ve recently changed my car. How do I update my vehicle details? How do I see my confirmed bookings? I want to cancel the booking but I’ve accidentally clicked ‘Pick Up’. What should I do? You should only tap “Pick Up” after your Hitch Rider has boarded your car. If you’ve accidentally done so, please don’t proceed to complete the booking in the app. Call us at +65 6570 3925 or email grabhitch@grab.com and we’ll cancel the booking on your behalf. What else should I take note of as a Hitch driver? We are all about social carpooling and social carpooling is about being SOCIAL. Be friendly (but not creepy) and break the ice by talking about your job, hobbies, anything really! Always confirm with your Hitch Rider immediately after accepting the booking AND before setting off to the pick-up location. It doesn’t hurt to check! Read through our Hitch Driver Code of Conduct for the exact behaviour that is expected of you in order to make sure everyone gets the best Hitch experience always! Created specially for the Hitch Driver Community, the Hitch Driver Blog is updated frequently with the latest happenings to help drivers stay connected!